Kick off the weekend singing some your favorite show tunes! The evening’s Millennium Stage performance is a Target Family Night: Honors Week Tribute featuring a Hamilton Sing-Along. Join noted DC musical theater performers in saluting the creators of Hamilton. It’s a celebration of the upcoming 41st Kennedy Center Honors, in which the co-creators of Hamilton – writer and actor Lin-Manuel Miranda, director Thomas Kail, choreographer Andy Blankenbuehler, and music director Alex Lacamoire—will receive special recognition for their groundbreaking work. The annual weekend-long festival featuring Nationals players, coaches, and front office staff returns to Nationals Park as a celebration of baseball and the holidays. Indoor and outdoor activities will include autograph sessions, curling stations, interactive games, clubhouse tours, batting cages, and of course photo opportunities with your favorite Nationals mascots, the Bullpen Cart, and Santa! Enjoy these activities and more with s’mores, adult hot chocolate, and other specialty food items at the home of your Washington Nationals! Make it a storybook holiday season this year and join Kramerbooks for Story Time with Santa! Gather ‘round to hear Santa tell your favorite festive holiday tales AND receive: Two Polaroid Instax mini photos of your child with Santa, a double-sided holiday ornament frame for each child, cider and hot chocolate for the kids (and nice parents), and spiked cider (for the naughty parents). This will take place every Saturday through December, and only 20 children’s tickets are available for each Saturday, so secure your spot soon! Celebrate the holidays with SAAM and The Washington Ballet. Acclaimed Artistic Director Julie Kent will give an introduction of how the ballet of the nation’s capital puts on their annual performance of The Nutcracker, then dancers will perform excerpts from the charming holiday classic. You can also enjoy holiday crafts, a scavenger hunt, and tasty winter treats from the Courtyard Cafe. Join Audubon Nature Preschool for story hikes, tours of their classrooms and grounds, and a Q&A with staff. There will also be a bake sale, including your morning coffee and hot cider, and a gently used children’s book sale – every child leaves with a free book! Register in advance here. As the days get shorter and colder, take time to appreciate the beauty of nature in Asian art. Drop by the ImaginAsia Studio in the Sackler for a family-friendly open workshop. Take a tour (offered 12:30pm & 2:30pm) to explore how artists depict the natural world in the permanent collections, then return to the studio to make your own nature-inspired holiday decorations. All ages welcome with adult companions. Santa is making an early appearance this holiday season. It will be an experience to remember as you watch Santa fly into the historic College Park Airport (it’s the world’s oldest continuously operating airport)! Make some holiday arts and crafts, then have your picture taken with Santa Claus after his big flight. For the 48th consecutive year, the Scottish Christmas Walk Parade will showcase marching units filled with the magnificent tartans of Scottish Clans, the stirring sound of Scottish bagpipes and drums, Scottish dancers, reenactment groups, Scottie dogs, dignitaries, classic cars, Santa Claus, and more. The parade begins at St. Asaph and Wilkes Streets and concludes at Market Square with a massed band concert, rain or shine. There will also be other festive events throughout the weekend — see the website for details. 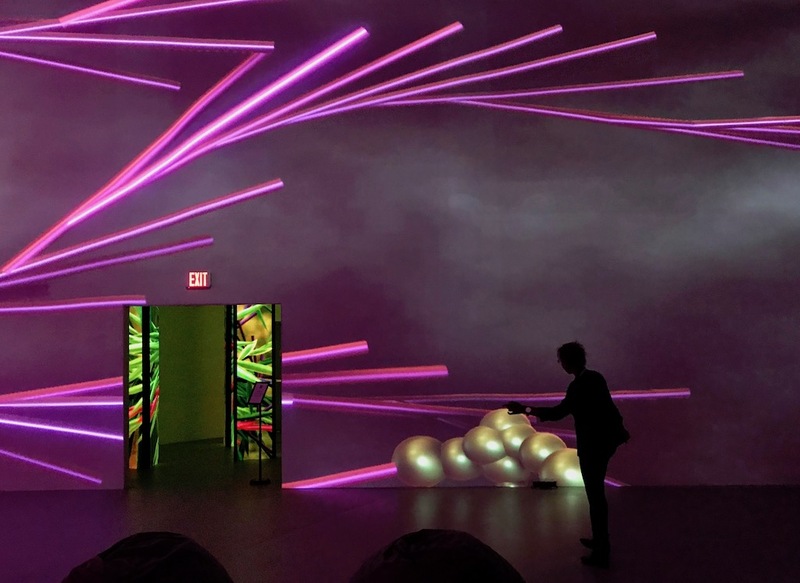 The newest exhibit at ARTECHOUSE invites you to experience nature in a whole new way — through a colorful digital menagerie of nature-inspired creatures and plant life. It’s full of stunning imagery and fun interactives that all ages will find delightful. Even if you don’t plan to go this weekend, plan a visit for later, and snag tickets now. And FYI: IF you go Sunday through Thursday you can get a family package — 20% off an adult and child ticket. Let your creativity fly at the Phillips’ new art-making stations — it’s an art materials “petting zoo” for the whole family! The workshop includes an Artful Wellness Kit for parents and caregivers. Geared toward families with children ages 2 to 8. If you’re looking for holiday-inspired entertainment to get into the spirit, it’s starting! Several productions of The Nutcracker will enchant audiences of all ages this weekend. Have some holiday fun at Fancy Nancy’s Splendiferous Christmas at Adventure Theatre or Elf the Musical at Olney Theatre. Join the ghosts of Christmas Past, Present and Future as they lead Scrooge on A Christmas Carol journey at Ford’s Theatre. Get details on these shows and see what else is coming up soon in the 2018 Guide to the Holiday Season. The Trolley Museum’s annual holiday fest begins this weekend. Guests can ride with Santa on the street cars and enjoy the model garden railway and holiday village inside the museum. Don’t miss the rest of the exhibits that offer a glimpse into the history of street cars. win door prizes, including gift cards to area businesses! Jam out with the local kindie rock fave at BloomBars on Saturday afternoon! Not only will there be great music, the venue has loads of instruments for the kids (and grown-ups!) to groove along with the band. Deck the halls during the holiday season with special gifts from the annual Holiday Gift and Craft Show. More than 50 crafters and merchants show their wares selling unique handmade items, baked goods, and more during the first weekend in December. There will also be special activities for kids, including a Children’s Holiday Shoppe, a show by Louis the Magician, and Lunch with Santa. Admission is $1 for the Craft Show, but kids’ activities cost extra — see the website for details. Join Watson Adventures on a unique Harry Potter-themed scavenger hunt that kids and adults will love! Follow in the footsteps of young wizards on a field trip to the National Gallery in search of art that echoes characters, places and enchanted objects in the famed Harry Potter books and movies. The hunt is not an addition to or variation on Harry’s adventures, but instead references to the books will provide a surprising bridge to many strange and wonderful works of art. This hunt is designed for kids and adults to do together (but all-adult teams are allowed to compete separately) Kids must be accompanied by an adult. Read about this super fun adventure in this KFDC post. There’s special fun going on at Port Discovery all weekend. On Saturday, get the wiggles out as you learn about healthy activities and habits for your little one — and your entire family! Dance, sing and get active with Faza Fam Family Jam. Learn about science at our STEM Station, and help Port Discovery kick-off birthday celebrations in birthday-themed Pop-Up Art stations and Mother Goose on the Loose(r) programs. Plus, join in a fun holiday tradition as you decorate gingerbricks with the fantastic chefs from McCormick! On Sunday, experience Port Discovery’s indoor magic designed just for kids. Explore movement and music together as you bop along to Tiny Tots Music Time. Join interactive story times, and work together to create art or science projects during Pop-Up Art or at STEM Stations. Plus, build early literacy skills for infants and toddlers in Mother Goose on the Loose(r). See Georgetown in a whole new gorgeous light — literally. Every evening through January 6, the neighborhood will sparkle with modern light art installations on exhibit throughout the bustling community, the region’s only curated outdoor public light art experience. Works of local, regional, and international artists will be on display in both public and privately-owned spaces, including M Street, along the C&O Canal, and more nearby places. Take the family to dinner, then go for a stroll to check them all out. Get a glimpse of a past light show here. Take a drive or a stroll through one of the many light displays in the area. The twinkling exhibits feature all kinds of delightful, festive scenes –holiday faves, animals, gardens, and the landscape illuminated in brilliant colors. You can find details for all of them in the 2018 Holiday Guide. Celebrate the holidays and see the beautifully decorated boats pass by. Get into the spirit as you decorate cookies and craft your own boat. Warm up by the big fire pit and visit the lighted Christmas Tree. Take the kids ice skating, and adults can sample winter drinks at our Waterfront Wine & Beer Garden. Bring the whole fam to meet Santa and make memories during this annual DC tradition! Alexandria’s harbor will shine as dozens of brightly lit boats cruise the Potomac River at the historic waterfront for the 19th annual Alexandria Holiday Boat Parade of Lights. Enjoy festivities out on the dock 4-7pm, including a Letters to Santa postcard pop-up, a DIY holiday wood ornament craft activity from AR Workshop Alexandria, and a hot chocolate bar from Dolci Gelati. Parade-goers are invited to step into the Torpedo Factory Art Center, located at the Alexandria City Marina, for their annual holiday festivities from 2-8pm. Head to this Holiday Pop-UP and enjoy shopping with local makers, Christmas tree sales from Olde City Farm and on Sunday, a gingerbread cookie decorating event with Bread Furst! Al children will receive one gingerbread cookie, freshly baked by Bread Furst, and a table full of decorative candies and icing. The best part? The kids take home the cookie to hang on the tree (or to eat:). They’ll have tables and about 12 chairs set-up for the kids, rotating spots about every 20 minutes (to give lots of kids a chance to decorate!). For kids 13 and under while supplies last. There are so many more great activities running through the season to celebrate the holidays in DC. Watch model trains buzz around models of U.S. train stations at the U.S. Botanic Garden Season’s Greetings exhibit. See the National Christmas Tree on the Ellipse. Enjoy Christmas on the Potomac at National Harbor. Deck the Halls at Tudor Place. Join the Frost Fest at Pentagon Row. If you hope to hit ‘em all, you better get on it! A few are highlighted below, but get the complete rundown on all the area’s holiday happenings, see the 2018 KFDC Guide to the Holiday Season. Chanukah is coming and with it, eight nights of family fun! Join PJ Library, the Edlavitch DCJCC, the Milton Gottesman Jewish Day School of the Nation’s Capital, Federation’s Jewish Food Experience and the interfaith program, Love and Religion, for hands-on Chanukah activities including crafts, cooking, singing, candle lighting, latkes, a mitzvah (good deed) project and take-home goodies. It’s a perfect morning for Jewish and interfaith families with children ages 2 and older. This is the Jewish counterpart to the National Christmas Tree Lighting. Every Chanukah, the National Menorah is lit in a ceremony on the Ellipse. Along with the lighting, there will be live entertainment, plus menorah kits and dreidels to take home. And if you don’t mind waiting in line afterward, you can stay for latkes and donuts. Tickets are free, but you need to sign up for them through the website. There are even more ways to celebrate the start of the Chanukah around the area. So if you want to spin the dreidle, enjoy crafts and snacks, and have a fun start to the Festival of Lights, check out the Chanukah section of the KFDC Guide to the Holiday Season in DC. Everyone loves chocolate and Annapolis will be celebrating by filling West Street with local chocolatiers ready to help chocoholics get through the holiday season. Prepare your sweet tooth with an afternoon of chocolate decadence as over 20 local and regional chocolatiers vend their specialies, plus make s’mores at a bonfire in the street, and enjoy hot cocoa from the popo. The Festival will also feature family friendly entertainment, holiday shopping, and the lighting of West Street’s BGE Holiday Light Canopy. * There’s a giveaway going on — you can win a Family 4-Pack of tickets to see Elf the Musical at Olney Theatre! * The Washington Post On Parenting blog has a nice article on raising generous children. * A new season of one of the best TV shows (imo) begins this coming week, December 5! I think the Alexandria Boat Parade is actually Saturday, not Sunday. Hope this (https://www.visitalexandriava.com/holidays/boat-parade/) helps!